This coming Friday I will speak at Northwestern's Buffet Institute for Global Studies in Evanston on 'States of Interpretive Denial in Myanmar'. 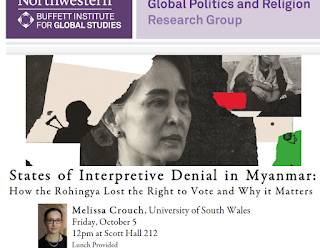 Abstract of the talk: The international community celebrated the 2015 Myanmar elections and the success of the National League for Democracy and Aung San Suu Kyi. It was even more remarkable that the NLD was then allowed to take power, given the history of the NLD being denied the right to form a government after the 1990 elections. Yet this was only part of the story. The global community by and large missed the legal act of excluding the Rohingya from the political community through disenfranchisement. This act of interpretive denial was executed by parliament, the courts and the administration through the deliberate denial of the right to vote or run for political office for those who held temporary identity cards. Building on Cohen’s theory of States of Denial, I examine ways in which law is a key tool in the process of interpretive denial. I trace two movements throughout Myanmar’s political history. The first was a territorial move, the constitutional creation of Rakhine State in 1974 and the making of the Rohingya as an invisible minority at the sub-national level. The second is a political move, the removal of the right to vote and run for office in 2015. As the global community struggles with how to respond to the crisis of genocide, I suggest that there is a need to understand the acts of interpretive denial that led to this crisis, beyond the issue of citizenship.